Even if you’ve already mastered your “look” and have certain products that you use everyday, odds are that your collection of cosmetics extends beyond the essentials. Every day it seems like there is a new blush or mascara that claims that it will change your life and it is so hard to resist the temptation to try out new products! If you are like a lot of girls, you are completely aware that your collection of makeup has spiraled into an ever-expanding jumble of impulse purchases, essential products, and a few too many eccentric lipsticks that you swear you’ll wear someday. In the back of your mind, you know that you theoretically could discard many of these items without struggling to maintain your daily makeup routine….but you just don’t want to! We totally get it, you spent money on these things for a reason and even if you never wear them, it’s nice to know that you could if you wanted to. 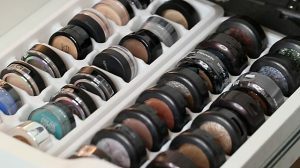 The problem is that your cosmetic hoarding has probably resulted in a collection that no longer fits in those compact pouches that are traditionally used to store makeup. On the one hand, you know that you could invest in a fancy vanity set. On the other hand, this investment has two downsides: first, if you have to buy furniture to accommodate your makeup, you must confront that you have a problem! Second, you know that spending money on a vanity means less money to spend on that new lipstick. The solution? DIY makeup storage! To help you out, we have compiled this list of our favorite creative and inexpensive ways to create your own makeup storage solutions. Most of these ideas involve repurposing items that you find around your house so you’ll feel incredibly clever and resourceful when you try these ideas out. We hope you enjoy this list of the best DIY makeup storage ideas! Whether you keep it simple and only have a few makeup brushes or you are a serious collector, it can be annoying digging through a makeup bag looking for the specific brush you need! Even when you finally find your desired brush, storing your brushes in the same container means that the excess powders which remain on your brushes can mix, and you may wind up with eyeshadow on your cheeks! 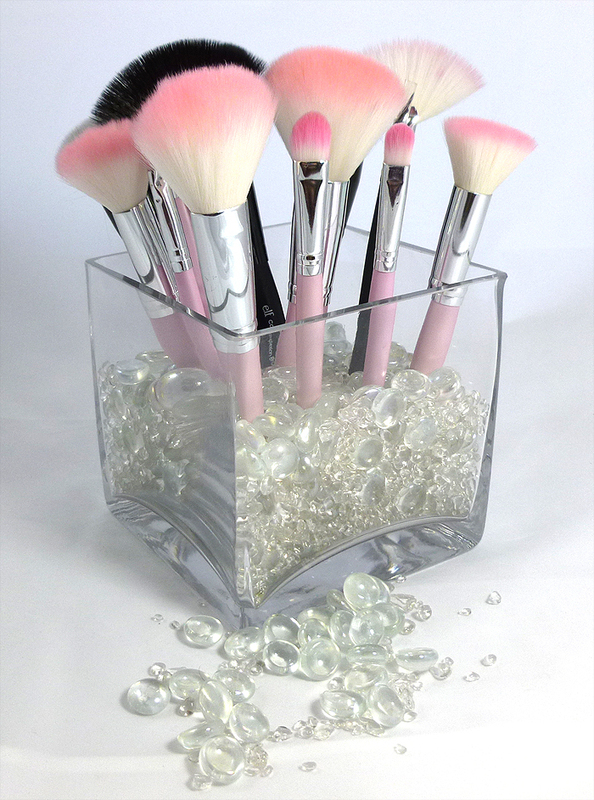 A fabulous and pretty solution is putting your brushes in a clear container so that the brush bristles stick up like a bouquet of flowers. In order to make this even cuter, you can add stones, marbles, or anything decorative to the bottom! Mason jars have become so trendy recently that even restaurants have begun serving beverages in these containers to stay on top of the trend! 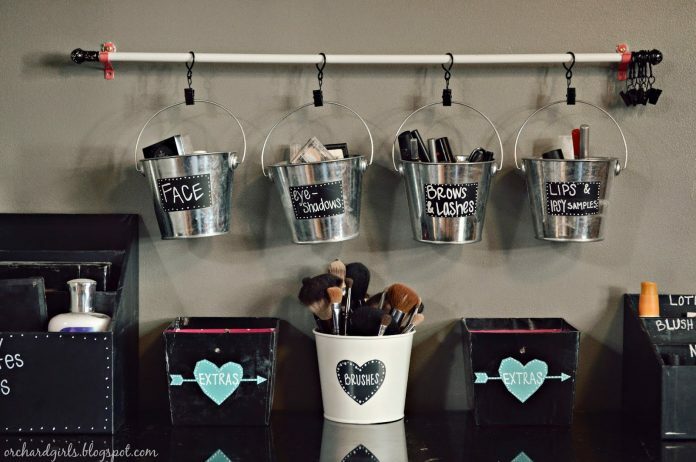 While you can definitely organize your makeup into makeup jars that sit on your counter, why not hang them up so that they add a little decorative flair to your bedroom or bathroom? 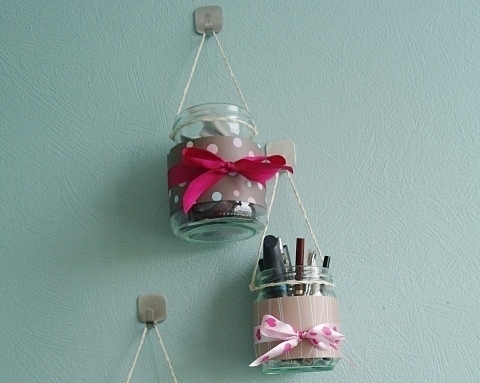 To create your hanging mason jars, tie a string around the lip of the jar to act as an anchor point. Then take another piece of string and tie one end of the string to one side of the anchor string. Take the remaining string end and tie it to the other side. After you install nails or another hanging device in your wall, just hang the jar filled with makeup and enjoy how cute and convenient it is! You can find desk organizers in any office supply store and you probably have a few lying around your house already. 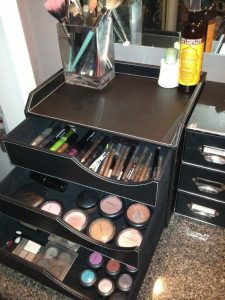 Many of these organizers are intended to contain paper so they include a few large drawers that are the perfect size for you to repurpose for organizing your makeup instead. If you want to give your new organizer a gorgeous makeover, you can always decorate the top and sides with a pretty fabric or gift wrapping paper. 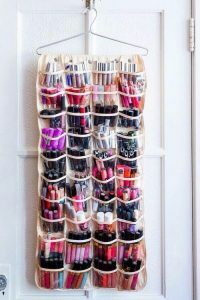 A hanging shoe organizer is a great way to store your shoes, but this same product can be used to organize and display your makeup! All of the clear pockets make it a breeze to organize your cosmetics by category and find what you need with ease. For example, you may choose to put all of your lipsticks in one row of pockets and use another row for eye makeup. Alternatively, you could organize your makeup by frequency of use. 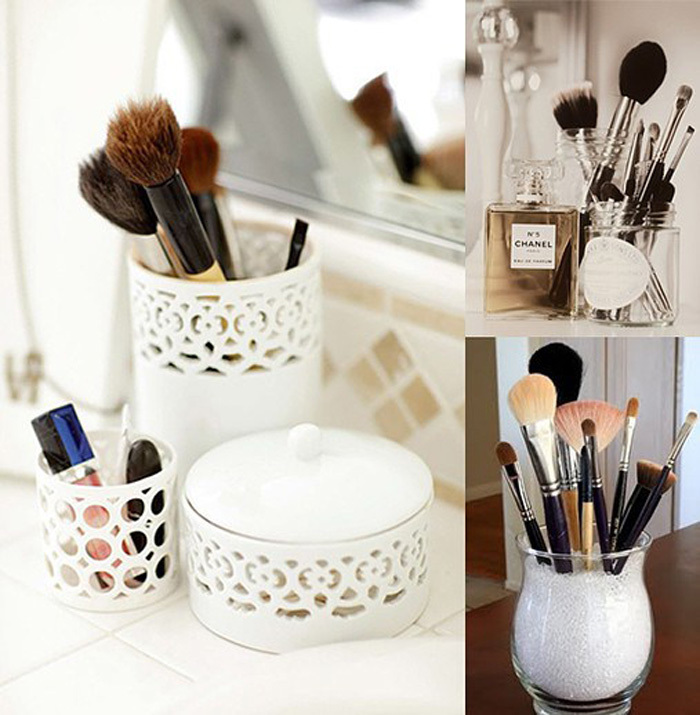 However you choose to organize your cosmetics, you will love how easy it is to find your favorite items! 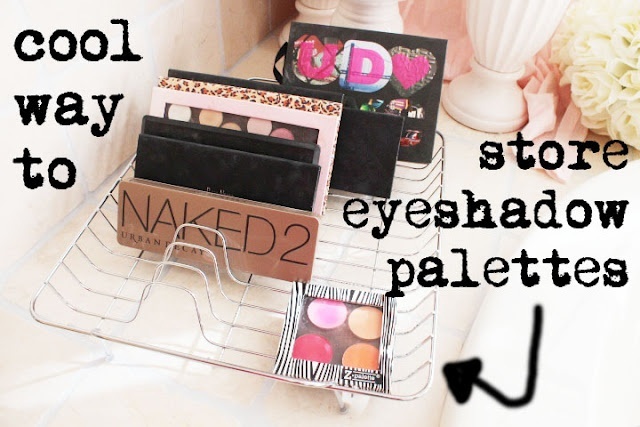 This DIY makeup storage solution is so clever and remarkably easy to recreate! Just use a bamboo mat (typically used to roll sushi) and weave a simple elastic band between some of the bamboo stems. The elastic creates a secure slot to insert your makeup items including brushes, lipsticks, mascaras, and other products! The great thing about using the mat is that you can roll the mat and create a portable and compact storage system! 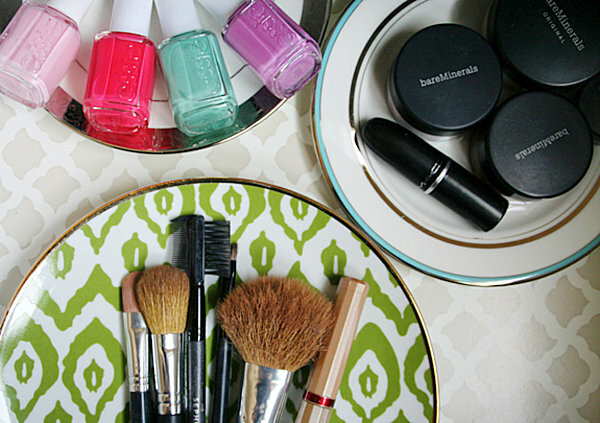 Old plates make for a great DIY makeup storage solution! 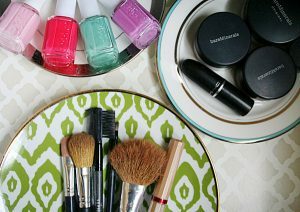 If you have any old dishes that are slightly chipped or don’t fit in with the rest of your dishes, you can repurpose them to create a stylish and fun makeup tray instead of just throwing them away. Don’t be afraid to mix and match dishes from different sets because the variations in patterns and styles will make your new makeup organizer even more unique! 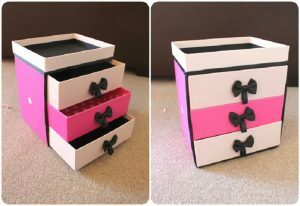 You can repurpose shoe boxes to create a multi-drawer storage system for your cosmetic collection. 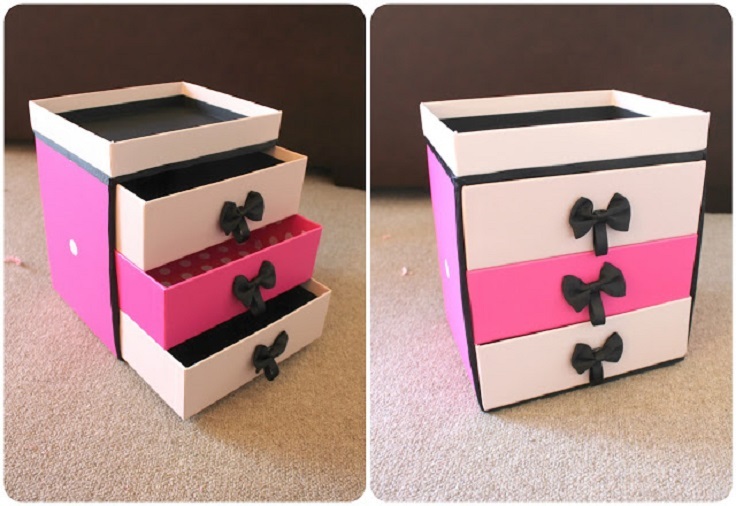 Use the bottom half of your shoe box as drawers that you stack in a larger box. 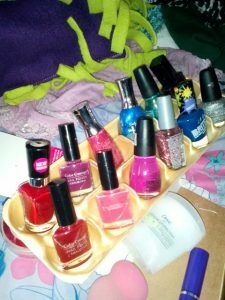 Glue a makeshift knob (like the lid to an old nail polish container for example) on the front of your “drawers” so that you can open them easily. On top, you can glue a shoe box lid upside down in order to create a tray for the cosmetics that you use everyday. If you want to be extra creative, you can use wrapping paper, newspaper, magazine clippings or other materials to decorate the boxes! 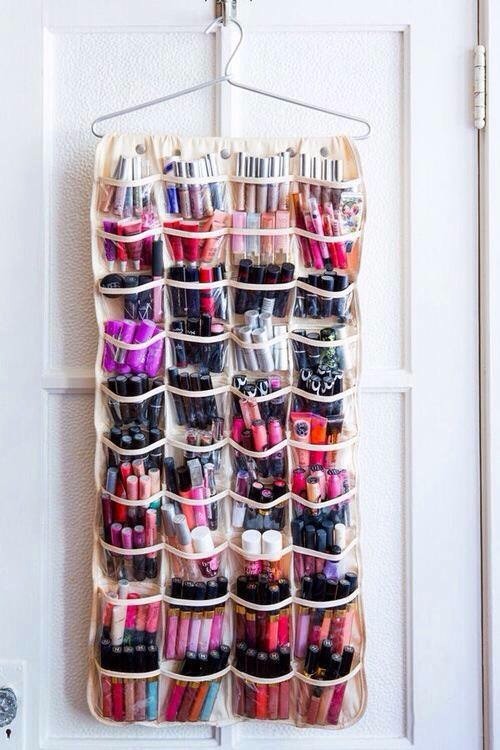 This is such a fun and gorgeous way to display your favorite cosmetics while making them extra accessible! You will need a large strip of magnet and some smaller magnets that you will glue on the back of the cosmetics that you wish to display. To make your magnet board stylish and beautiful, wrap the board in some sort of decorative paper or thin decorative fabric. Glue small magnets to the back of your cosmetics and place them on the board. 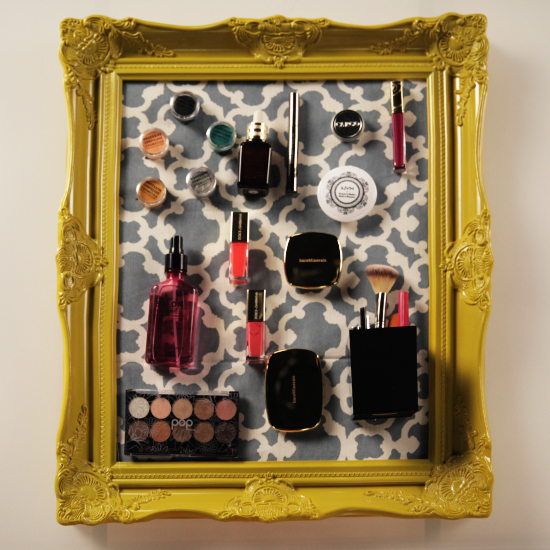 While you don’t have to place the magnet board in a frame, using a frame adds an extra element of glamour to your DIY makeup storage board! 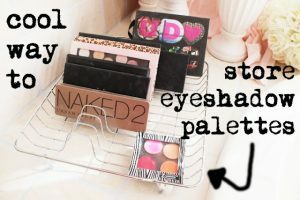 Simple and inexpensive dish racks make for an amazingly useful and convenient solution for your makeup storage needs! Palettes fit perfectly into the slots in a dish rack and you will love how easy it is to find the palette you are looking for! If you want to give a burst of personality to your dish rack, try wrapping colorful ribbons around the dividers. Wearing makeup is like painting your face, so why not use a real painting palette to display your cosmetics in a fun and creative way? 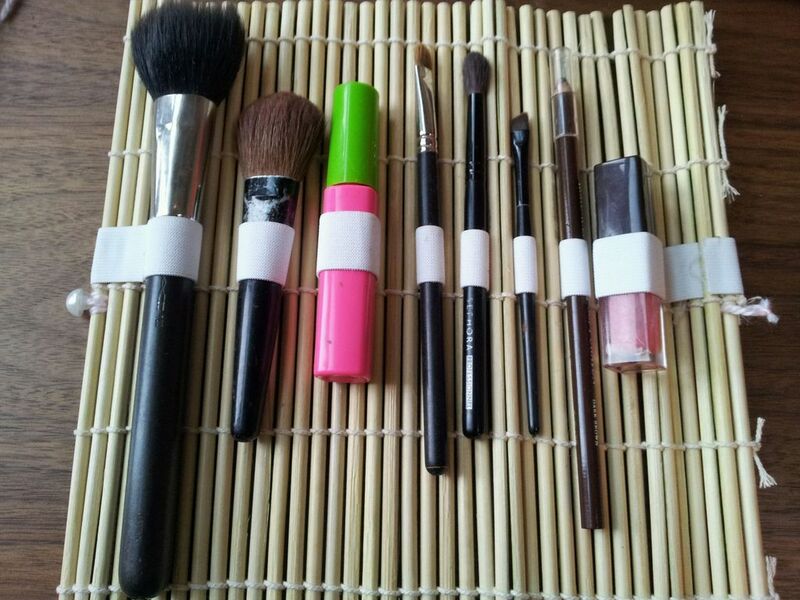 Simply add a small piece of velcro to the back of your selected cosmetics and to the palette. 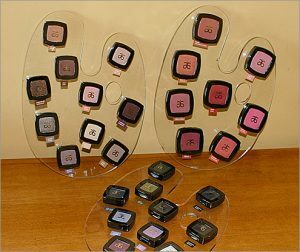 This is an imaginative and convenient way to display the various colors in your cosmetic collection and you’ll enjoy feeling like a pro! Lipsticks are so fun to collect! The problem with having a ton of lip products is that they can be difficult to keep track of and rifling through your entire makeup collection to find the shade you want can be a hassle. A fabulous and creative solution is to display your lipsticks on a stand using copper pipes to separate the lipsticks. 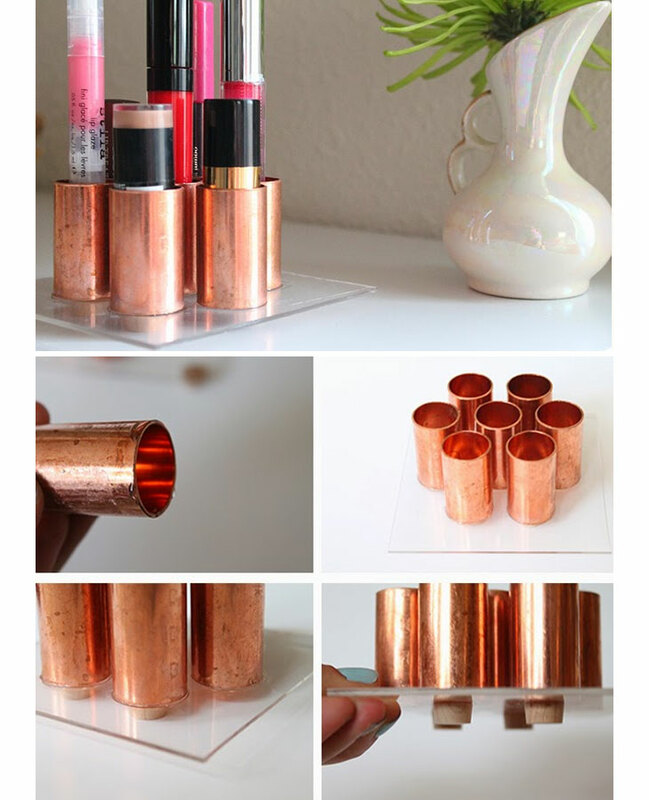 In order to make this DIY makeup stand, you need copper pipes, a flat sturdy surface of your choosing, and glue. You can get inexpensive copper pipes from the plumbing section of your local hardware store and you can pick up the item you wish to use as the surface as well. Depending on the look you are going for, you may wish to try a plexiglass sheet (also known as acrylic) or you can even use a plank of wood. Just glue the pipes on your surface and then place individual lipsticks in each pipe. You can also put mascara or other long products in the copper tubes, but this DIY project is definitely perfect for lipsticks! Candle stands are so elegant and they make any candle look better! These stands are not only great for creating an awesome ambience with candles, but they are also a great way to display your makeup containers. Just fill up a few mason jars with your cosmetics and then put the jars on the candle stand where you would normally put a candle. Yes, you could simply keep the jars on your sink or counter, but why not have fun with your makeup organization and display your favorite products on a gorgeous and sophisticated stand? Although you wouldn’t expect it, ice cube trays are great for makeup storage! The ice cube slots are perfectly sized to fit cosmetics like individual eye shadows or lip balm pots. You can keep it simple and just use the tray as it comes, or you can try decorating the tray with paint or glitter to add some flair to your new DIY makeup container! Using an egg carton is a clever and resourceful way to organize and display your nail polishes! Each egg space is perfectly sized to accommodate most brands of nail varnish so this DIY container is incredibly easy to use. Since egg cartons are boring looking, don’t be afraid to decorate the carton with paint or other crafty materials of your choosing! Using old toilet paper tubes is perhaps not the most glamorous material to use to create a DIY makeup container, but it is super inexpensive, convenient, and easy to personalize! Just glue a few toilet paper tubes to a surface of your choice so that they are standing up. If you want to get creative and have fun with creating this organization stand, you can paint the toilet paper tubes. 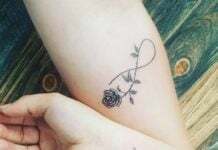 You can also wrap them with decorative paper or a decorative fabric and add other elements like beads or random trinkets. You should try cutting the tubes so that they are the perfect height to house specific types of cosmetics. For example, to house your brushes, you can keep the tubes at their original length. For lipstick purposes, you may want to cut the tubes in half so that you can easily grab the lipstick from the tube instead of needing to dig for it. 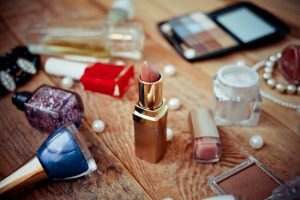 Even if you know you have a lot of makeup items that you don’t use very often, it can be so hard to throw away the things that other people might call your “extra” cosmetics. Creating a DIY makeup stand is the perfect solution for girls who don’t want to spend money on an expensive organizer, or who aren’t willing to part with the extra makeup that makes having an organizer necessary! As you can see from this list, there are a ton of things around your house that you can repurpose to create an awesome and creative makeup storage container. 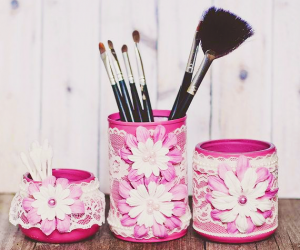 Hopefully this list has given you the inspiration you need to create a fun and unique DIY makeup storage container!